I am rapidly approaching my final desk-bound moments, as I leave (or, rather, escape) the world of financial security, health insurance, and predictability. Soon, I’ll be caring for a jubilantly contented four-month-old boy and his active and uppity two-year-old sister. I’ll be paid menial wages for full-time work, but I couldn’t be more excited! Though I might be called an old soul in some respects, perhaps, I have also always been a child at heart, as those who know me really well could probably attest–and the monotonous drudgery and stress of the work-a-day grown-up world grows ever more distasteful to me the longer I sojourn here. I shortened that sojourn considerably by missing two and a half days of work last week, as I begrudgingly succumbed to the groggy, coughing, congested apathy of a lingering, languorous cold. With a sluggish mind and an apathetic will, I sought recreation during my few, medication-muddled waking hours in animated films. While I have nothing against Disney or Pixar, personally, throughout that cold-ridden week the vibrancy and energy of those silly sing-alongs and adorably computer-generated children’s tales would suit neither my listness mood nor my decreased level of alertness; thus, I turned my thoughts to those films, like Miyazaki’s, which could at once distract and delight my already befuddled brain with their admittedly bizarre but comparably subdued otherworldly flairs. One advantage to this plan is the ridiculously high number of occurrences of cats as characters or themes in truly great, and especially foreign, animated films–but, even setting that consideration aside, I was immediately pleased with the tone and quality of the films I’d chosen to watch. There was something surprising and exciting about each time that these unrealistic, exaggerated, and sentimental little films revealed at their depths something sad, yet beautiful … quixotic, yet true. Even those films whose trite and cliched axiomatic themes allowed for no more profound interpretations of their meaning, were capable, by their skilled execution of breathtaking animated sequences or genuinely innocent amusements, to produce a depth of spontaneous delight that at once solidified their value to me and incited in me the desire to watch yet another and another as the sluggish, sickly hours passed with newfound alacrity and contentment. My enthusiasm for these animated films is such that I might actually someday post a brief recommendation for each on a separate page of this blog. But among the twenty-something films I viewed while I was ill, one in particular encapsulates what I would call the very spirit of animation–and within its silent, shadowy, sorrowful world, so many truths are brought to light. 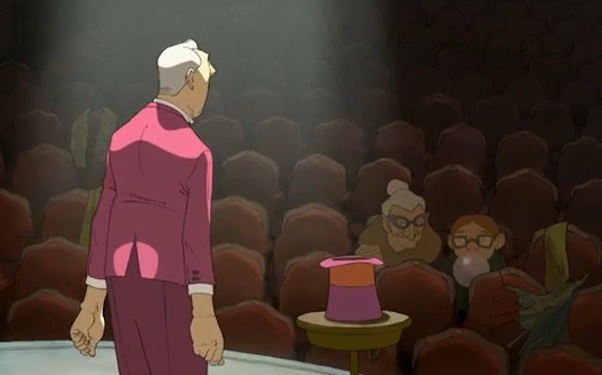 It’s called The Illusionist (made in 2010 — not that live-action nonsense from an earlier year), and it hails from the imagination of French animation director Sylvain Chomet, who earlier brought us that strange and fascinating 2003 film, The Triplets of Belleville. The title character of the film is an elderly gentleman who (forgive me for the many spoilers that shall follow) begins to find that his humble vocation–that of the outdated magician, pulling a pudgy and disgruntled white rabbit from a shabby hat or producing from thin air a chain of cloths or a few coins–is no longer apppreciated nor understood by the general populace, whose affectio ns have turned to rock stars and lounge singers, jukeboxes and fancy clothes. After a series of failed employments and disappointments, Tatischeff the magician encounters a servant girl whose naivete and exuberance haven’t yet been disenchanted–this girl is still mystified by the elderly man’s craft, and especially so when he produces out of nothing (or, rather, out of the meagre earnings from his recent performances) a pair of bright, red slippers to replace her tattered and ugly old boots. Unfortunately for her, as for the rest of the world, “magic” becomes inextricably confused with such productions of material goods and modern enjoyments. No longer does the sheer illusion produce a delightful effect, and as Tatischeff’s own career fades into nothingness, so does light fade from the city streets as we are told, quite plainly, that magicians do not, sadly, exist. But there is a reason why we feel sad at this declaration–deep down we know that it is the audience, not the magicians, who are inadequate. The “illusions” that the magician produces are somehow, we feel, more real than the fleeting, material illusions that are chased after by all those who ignore Tatischeff’s true magic. How sad to live in a culture in which the wonder of watching a ladybug land on a leaf, the childish joy of suspending disbelief in order fully to invest in some fantastical story, or the realization that there is a kind of revelatory, meaningful truth that isn’t packaged in propositions or rationalities–are forsaken in favor of temporary pleasures and shallow, banal pursuits. Just as a child feels no shame in expressing the depth of emotion produced by the simplest discoveries in life, and just as he feels no embarrassment for believing in the magician’s sham, so shouldn’t adults feel free to embrace the mystery of the earth, of Christianity, of life itself? Is there not a contentment and an innocence to be admired in these young and not-yet-disenchanted beings? What a satisfaction it might be to revel in amazement at all the things we don’t understand, instead of grasping restlessly at proofs or facts or cold, distant knowledge! I love animated films. They remind me that the world is enchanted–that Providence’s all-encompassing works are magical, mysterious, and deeply beautiful. They invite me to be a child, and to forsake the compulsion to submit all things to my oh-so-practiced analysis or judgement. They help to validate the significance of simple delights in a world where adulthood has been largely robbed of faerie and fantasy, mystification and marvel.